Micro Python is an implementation of the Python programming language, written from scratch and optimized to run on micro-controllers such as the ones based on ARM Cortex-M cores. Damien George, the developer, also designed the Micro Python board powered by STMicro STM32F405 Cortex M4 MCU for the purpose of running Micro Python. 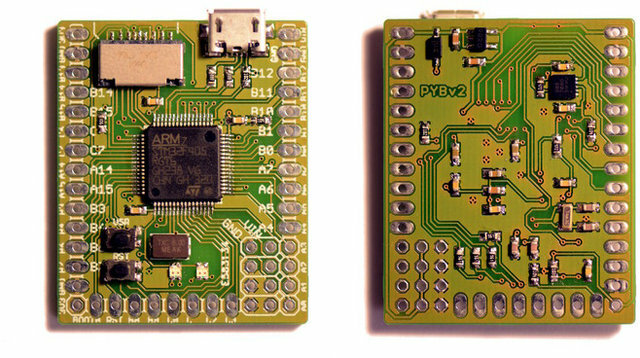 MCU – STMicro STM32F405RG @ 168MHz with 1MB flash, 192KB RAM, and an FPU. 30 general purpose I/O pins – 5 USARTs, 2SPIs, 2 I2C busses, 14 ADC pins, 2 DAC pins, 2CANs, and 4 servo ports with power.